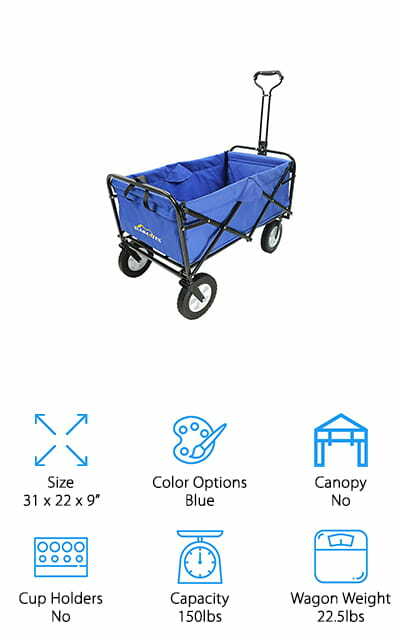 Do you often find yourself needing a small handcart or wagon to help you carry stuff around the house or in your backyard? Or maybe you want something more suited for outdoor use, for festivals or camping? We’ve got you covered! This folding wagon buying guide will help you choose the best storable wagon for your needs! Let’s take a look at some of the things you should take into account before you start shopping. Size: Is the wagon going to be big enough to carry all the things that you need it to in one trip? Each wagon is different, and each has a different set of internal dimensions to tell you this. 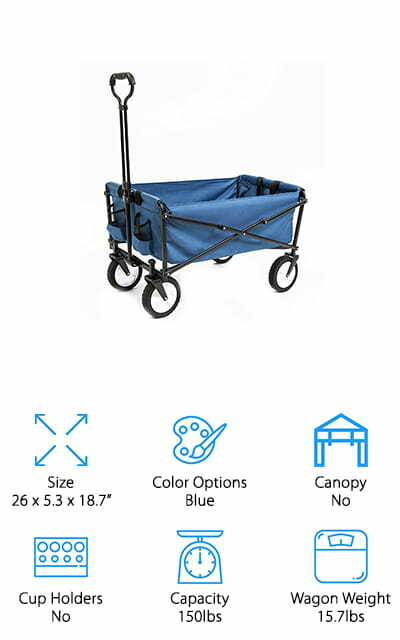 Color Options: Most foldable wagons are going to come in a plethora of colors to help you customize your experience. This is mostly a personal thing, so you can choose the color or colors that you like best. Canopy: There are a few folding wagons that come with canopies over them. These can usually also double as a wagon for moving children around in, and the canopy is to protect them from the sun. It’s pretty neat. Cup Holders: Some wagons come with cup holders built into the lining of the wagon. If you have drinks or other open containers that you don’t want spilling all over the place, this is really convenient and leaves your hands free. Capacity: This is how much weight the wagon will hold. For most foldable wagons with cloth sides, this tends to be about 150 pounds. Anything more than that and you run the risk of the wagon getting stuck. Wagon Weight: This refers to how much the wagon weighs. This is important for when you get ready to store it. These wagons fold down to pretty compact sizes, but they might weight a lot as well. Now that you know what you’re looking for, let’s get to the folding wagon reviews. Not all of these products are created equal, so you’ll have to find one that matches your lifestyle and the things that you want to do with it. If you’re eager to get rolling, check out our top pick and budget pick first. They’re the best of the best! The rest of the list is pretty amazing as well, so read on until the end! This great Mac Sports Wagon comes in seven different color options, including black, camo, pink, green, grey, red and blue. It can fold down to an incredible 8 inches thick so it doesn’t take up that much room to store! It’s so easy to set up that you can get it done in seconds! The fabric that it’s made out of is durable and easy to clean, and it won’t rip or tear anytime soon! You can hold up to 150 pounds of stuff in this wagon. The handle adjusts to your height and preference, and two mesh cup holders help keep your drinks from spilling while you haul stuff. Use it around the house or for outdoor music events! It works perfectly on all surfaces, making it the best folding wagon on our list for sure! We love all the room it has inside for carrying stuff, making it easier for this little workhorse to help around the house! Our pick for the best cheap folding wagon is this model from YSC. It is lightweight compared to some of the other wagons on this list, as it only weighs about 15 pounds. It’s the perfect storing weight if you aren’t going to be using it as often! It folds down relatively small. 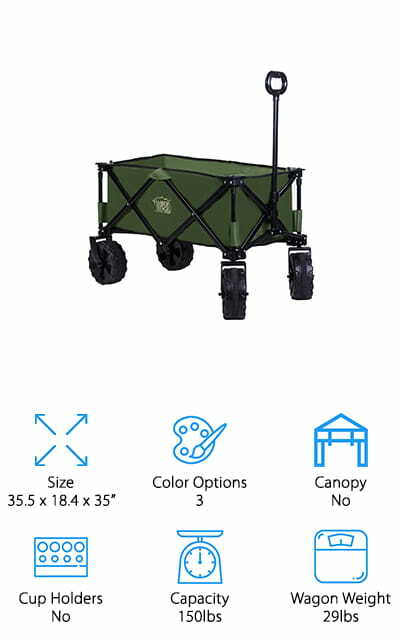 The sides of the wagon are made of durable 600D Polyester fabric, which means that it’s unlikely to rip on you, and it will be easy to clean in the event of a spill. There’s no assembly required; it comes put together, you only need to pop it up to use it. Carry groceries into the house with no hassle, or use it to move larger plants from one place to another. It comes in three great colors, which include black, navy blue, and even red. For the price, this wagon really can’t be beaten! We love how easily it rolls over flat, level surfaces. 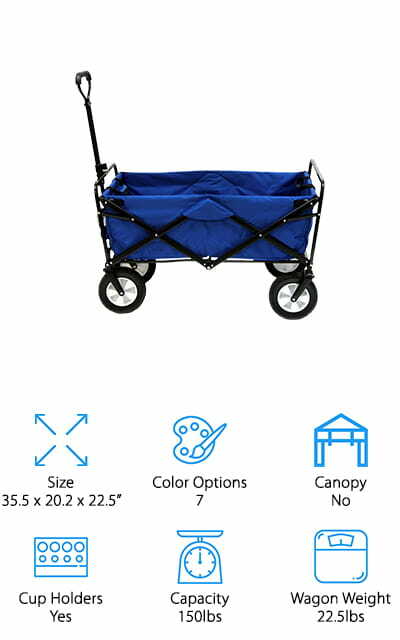 The Timber Ridge Folding Wagon comes in blue, red, and green, so you can choose which of those you prefer! Its front wheels rotate a full 360 degrees, allowing for easy steering and maneuvering over most terrains, even rocky or uneven ground. That also makes it one of the best wagons that we looked at for camping or outdoor activities. It even rolls fairly well on the beach as long as it isn’t completely loaded down. It can carry a lot, though, and at a 150-pound capacity, you can haul just about anything. The space inside is large enough for a lot in one trip. The wheels are a full 8” in diameter! It folds down really small and comes with a convenient carrying bag, so you can stuff it in the trunk with your other gear and take it with you! The fabric is super heavy duty so you don’t have to worry! The Seina Utility Wagon comes in just blue, but that’s perfectly fine! The fabric is a high-quality polyester blend that you are sure to love, as it won’t rip or tear very easily. The handle locks into place for perfect steering, allowing you to move along all sorts of surfaces, even slick or bumpy ones. It also telescopes out to accommodate your height or preference, or even what you’re pulling! The wheels are rubber, all-terrain tires that are 7 inches in diameter, big enough to get the tough navigating done with no issues. When you want it folded up, the black powder-coated steel frame easily folds down into a compact space. The handle locks into place so that it’s easy to transport even while folded, so it doesn’t get in your way. That makes it portable enough to take it anywhere with you! Get all the help you need in this versatile little package! 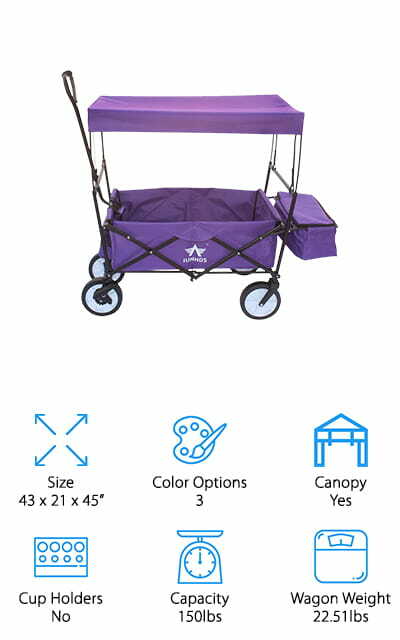 Wonderfold makes this great outdoor wagon, which comes in purple, red, and brown, which are pretty unique colors compared to the rest of the list. The tires are made of EVA foam that molds perfectly to any occasion. There are even bearings in the wheels so it rides better and doesn’t jostle around. There is a safety break as well because this wagon is unique on our list for one thing. Your kids can ride in it! It is meant specifically for this purpose. The bottom of the wagon is cushioned so they are comfortable while riding, and the handle telescopes out to help whoever is pulling them around. It’s got an auto lock for the front tires, so they won’t move unless the person outside the wagon tells them to. We love that it comes with a nice canopy to protect your kids from the sun. It’s the best folding wagon for sale right now! The Summates Utility Wagon is perfect for carrying gear onto your campsite, to your boat, or around in your garden. If you need a device to help you move some plants for potting, this is the workhorse for you! It’s got a strong steel frame to help you carry even the heaviest gear, up to 150 pounds at one time. The assembly is simple and it easily folds down to a manageable size for storage or travel when you aren’t using it. The fabric that the sides are made of is durable polyester with polyurethane backing, so you know it’s not going to get damaged anytime soon. The rubber wheels make it easier to run over all types of terrain, and when you’re done it folds down to only about 8 inches thick! It works wonderfully for carrying groceries inside if you buy a lot at the time. It’s the best folding utility wagon we could find! 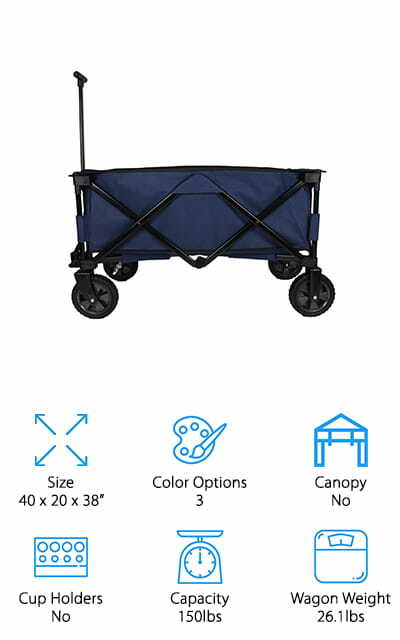 The Patio Watcher Wagon makes a good trolley for transporting your shopping, car parts, and whatever else you need for outdoor sporting events, gardening, or a family trip to the park. You can carry just about anything in this cart, up to 150 pounds! It comes in blue, grey, and red to fit all of your needs. The telescoping handle and 7-inch directional rubber wheels help it move easily over all types of terrain and ground cover. The wheels rotate 360 degrees, and there is a brake system across the front wheels so the cart stays in place when you’re loading and unloading it. The fabric that makes up the wagon walls can be removed and washed by hand or hose. The colors won’t run! 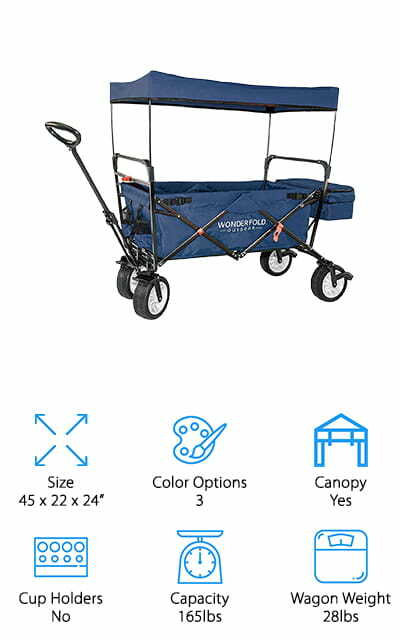 This cart folds down small enough to store in a closet or in your trunk, and it folds down into the carrying bag that is included for easy portability. We love it! 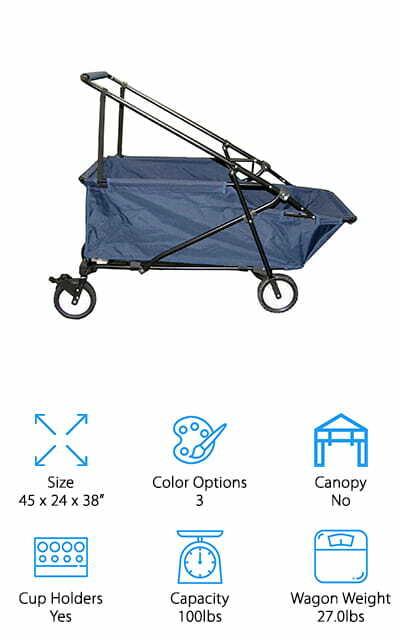 This Sports God Folding Wagon sets up with no assembly, and you’re ready to go in seconds. It’s got a huge inner capacity that allows you to haul a lot of stuff at once. It comes in blue, purple, and red, so there’s a color for everyone. When you’re finished using it, it folds down to 8 inches thick and fits inside the provided carrying case. The fabric is easy to clean and extremely durable, so you can move whatever you need to without worry! Up to 150 pounds, this cart will move any of your gear. There is even a canopy included that can be removed, though in this case the folding wagon is not recommended for moving children. But it’s perfect for a cooler on a hot, sunny day! 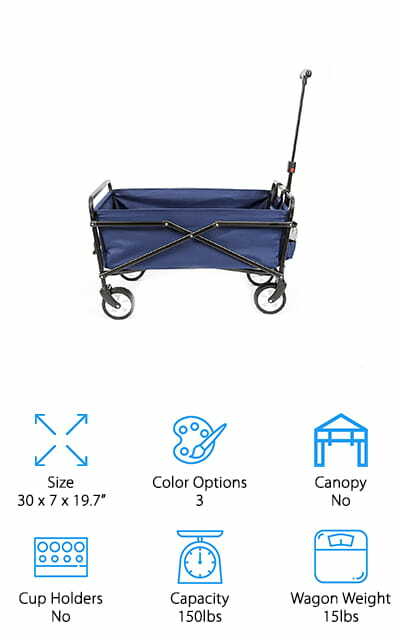 It comes with a free small cooler and small storage basket, making this the best folding wagon with canopy on our list! We love all the extras. 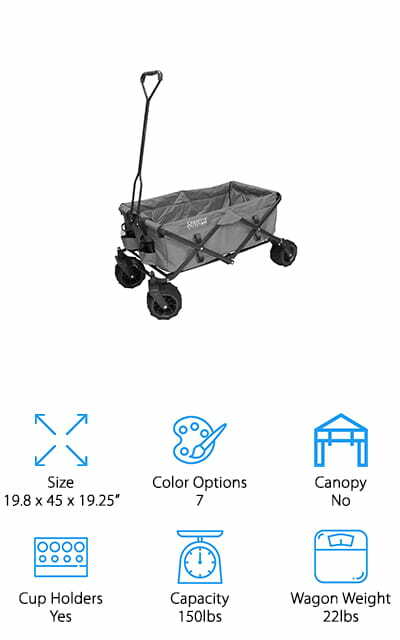 The last entry on our list is the best folding wagon for beach use, because of how easy it is to move across sandy surfaces. It comes in blue, camouflage, and red colors so it’s a perfect fit for everyone! It folds down flat for storage in a closet or in the trunk of most cars. It’s great to have around in case you need to haul a lot of groceries, beach fun accessories, or picnic fixings. The sides are made of heavy-duty polyester that won’t be easily damaged. You can carry up to 100 pounds of stuff at a time, which is a lot! It has a steel frame that is both durable and flexible to enable it to fold down perfectly every time. You won’t need to assemble it even when you first buy it, as it’s done for you. There are even two mesh fabric bottle holders to keep your drinks within reach! Creative Outdoor Distributors offer this Wagon with unique color options and lots of space, including storage space! The wheels are 4 inches wide and can swivel up to 360 degrees, so it’s easy to steer and plow through even sand and snow. The frame is made of steel that easily folds down when not in use and locks in place when it is. It comes in camouflage, purple, a purple/grey combination, bright yellow, and even a blue color with paw prints all over it for hauling dogs or your dog’s stuff! There are six pockets located along the inside that can hold phones, keys, and even drinks. It comes with a storage sleeve to keep the fabric nice if you have to store it for a longer period of time. The fabric is super durable and can be removed for washing under the hose. We love all the pockets, and that the fabric can be cleaned separately!